Within our Texas Baptists family, 90 percent of pastors reported some level of financial stress in their family and church work. Some pastors rely on second jobs or maximizing credit card limits to cover bills and expenses. Other pastors fight to stay in full-time ministry. Some walk away from their call to ministry due to overwhelming debt and finances. But, there is hope for Texas Baptists pastors in the midst of financial adversities. 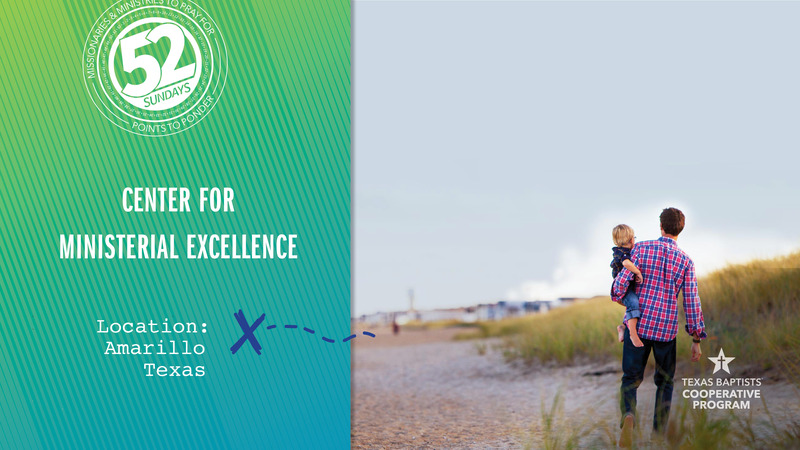 The Center for Ministerial Excellence (CME) is a ministry of Texas Baptists which provides support for pastors through grant funds and financial literacy. Each month, Tammy Tijerina, CME director, receives many phone calls and emails from pastors in need of financial support and education. Tammy coordinates regional one-day retreats to provide an opportunity for pastors and selected members of their church leadership to be refreshed on the theology of stewardship, and personal and church budgeting. Also, grants are made available through the Ministerial Excellence Fund to ministers struggling financially so they receive the help they need. The Center for Ministerial Excellence works to ensure that pastors are supported and are receiving the help they need to minister well without worrying about debt or their finances. Our church’s gifts through the Cooperative Program fund the work of the Connections Team which networks with ministers and connects them with the CME. Please pray for Tammy, the Center for Ministerial Excellence and the pastors they assist.